Situated where the Athabasca and Miette rivers meet, the Jasper townsite stands in the very heart of the Jasper National Park in Alberta (AB), and is regularly visited by thousands of tourists throughout the year. Jasper has a noticeable small-town charm and is less developed than nearby Banff, which is much of its appeal. The Jasper National Park is part of the UNESCO World Heritage Site and is home to Alberta's highest mountain, Mount Columbia. Known for its abundant wildlife and plentiful hiking trails, Jasper offers an enormous range of outdoor activities, in an attractive, alpine setting. Life in the Jasper townsite is centered in the downtown district, which is based around Patricia Street and Connaught Drive, with many top restaurants, shopping areas, hotels, museums and tourist attractions. Popular excursions from Jasper include trips to the nearby Patricia and Pyramid Lakes, Annette and Edith Lakes, and also the Monashee Mountains, all of which offer a range of recreational activities. Despite being fairly small in size, Jasper has a high concentration of hotels and accommodation, catering for the seasonal influx of tourists who visit this town each year from all over the world. Particularly busy around the skiing season, the best hotels in Jasper quickly become full booked as demand is often high. Central hotels are the most popular and line the main streets in downtown Jasper. 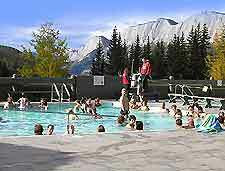 Further accommodation can be found in the surrounding areas of the Jasper National Park, with cheap hostels being popular with backpackers and available on Whistlers Mountain Road and along Maligne Lake Road. Nearby camping grounds are also in demand and can be found along the Icefields Parkway and alongside the scenic Athabasca River. More information about Jasper Hotels. Being part of the enormous Jasper National Park, Canada's biggest park of its kind, it is hardly surprising that tourism is such big business in the Jasper area. The main tourist information bureau in the town is the Jasper Information Center along Connaught Drive, in the heart of the downtown district. Here you will find helpful staff offering a range of travel tips and tourism advice, together with leaflets about tourist attractions, day trips and activities. 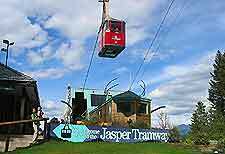 Jasper's main tourist attractions include the popular Jasper Tramway - the country's highest cable car rides, offering superb views of the Jasper National Park and the surrounding area; Jasper Activity Center - featuring a large number of recreational activities and sporting activities throughout the year; Walking Tours - scenic tours of the Jasper National Park, offering a real insight into the indigenous wildlife and native plants; Icefield Center - located on the suburbs of Jasper, with views of glaciers, a visitors' center and a number of viewpoints; and the Jasper Fitness and Aquatic Centre - containing a large swimming pool and a range of water-based things to do. Notable landmarks and monuments in the Jasper area include Maligne Canyon - a truly stunning gorge on the outskirts of Jasper, with striking drops and high bridges; Athabasca Falls - a dramatic natural waterfall, with nearby walking trails and white water rafting possibilities; and the Miette Hotsprings - famed for its natural hot bathing pools, which attract both locals and tourists from the Jasper area. 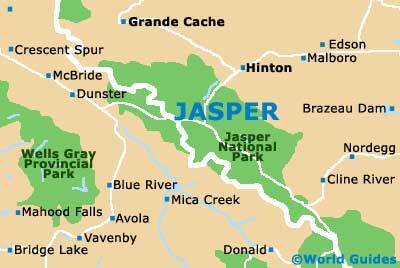 More information about Jasper Tourist Attractions and Jasper Landmarks and Monuments. Some of Jasper's main museums and art galleries include the Gallery at Jasper Park Lodge - actively promoting a range of art works by local Canadian artists, in the center of downtown Jasper; Jasper Yellowhead Museum and Archives - celebrating the area's rich history and heritage, containing a range of important documents, artifacts and educational information about life in Jasper many years ago; and Den Wildlife Museum - one of Jasper's most popular museums, dedicated to the region's plentiful wildlife, with many sympathetically mounted stuffed animals and other exhibits. More information about Jasper Museums and Art Galleries. Tourist attractions located close to Jasper include white water rafting - always popular with daring, thrill-seeking Jasper tourists, with regular rafting trips along the Athabasca River, taking in the Canadian Rocky Mountains scenery; Mike Wiegle Heli Skiing - custom helicopter trips which transport you to some of the best ski locations in the area, appealing to the more wealthy skiers; and Marmot Basin - standing on Jasper's southern suburbs, famous for its exceptional skiing, stunning views and comprehensive, world-class skiing facilities. More information about Jasper Attractions Nearby.